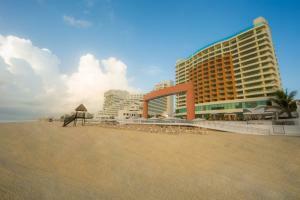 This 287-room oceanfront resort is located in the heart of the Hotel Zone. It offers mesmerizing views, spacious, bright rooms with light-color bedding with high quality linens, contrasting woods, and stylish decoration. Enjoy the view while the kids enjoy the exclusive Kid's Club. Non-motorized water sports, daily activities and theme nights are included. Enjoy exchange privileges at select Palace Resorts. Ask about wedding packages and Passport to Savings. On the beach, 5 minutes from the Convention Center, 15 minutes from downtown, 20 minutes from the airport. Tequila (Breakfast & Lunch International Buffet, and Mexican a la carte cuisine for Dinner), Bocelli (Breakfast & Lunch International Buffet, and Italian/Mediterranean a la carte cuisine for Dinner), Wok (Oriental a la carte cuisine for Dinner), La Terraza (Fast cooked meals for lunch, and a la carte grilled fine cuts for dinner), and Room Service.